This is your lucky day – for as sure as ol' Santa Claus has fed an' conditioned his reindeer team while pressin' the elves to repair and polish both harness an' sleigh, I'm here to give you the perfect tip for fillin' all those Christmas stockings on your list. Each of you know the multitudinous talents of Tri-State Livestock News columnist and writer Jan Swan Wood; an' the lucky ones among you busted some stitches an' spewed a little coffee 'crost the table while readin' your copy of her first book of original cowboy cartoons, IT'S A GREAT LIFE IF YOU DON'T WEAKEN, published back in 2010. Dedicated to liftin' our present gloom, the gal has come through with a second fine publication, just in time for your holiday shopping. 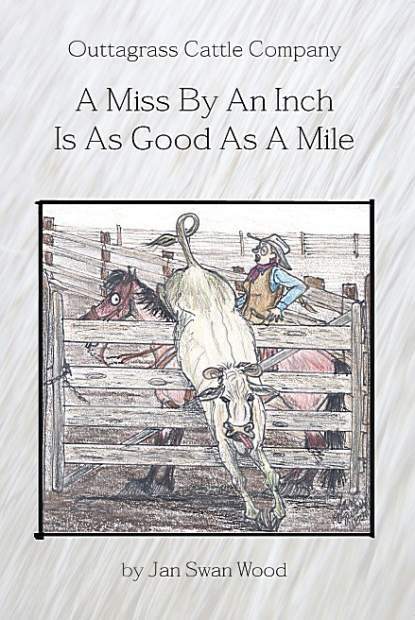 A MISS BY AN INCH IS AS GOOD AS A MILE is the title of this delightful missive, which features all new material and is named for a favorite saying of Jan's mom, the late Wilma Swan. Known across a wide community as the "Ninja driver" of gumbo roads – pushing an old black Chevy loaded with kids and groceries through bogs most male-operated, chained-up four-wheel-drives couldn't have negotiated – Wilma is said to have uttered that truth many a time after hair-breadth escapes from certain death by drowning in raging creeks trying their best to engulf the Chevy! The varnished cover of this book boasts some of Jan's best art, and her inimitable style comes through in each gut busting cartoon. You'll find that color section in the center, just like the first book; an' you don't have to limit your gifting to ranchers and rural folk, 'cause Jan's humor-language is generic enough to be interpreted by the stuffiest town-dweller. I've actually watched and heard people who didn't know a cow from a fencepost bust up in belly laughs from page to page, until forced to come up for air and wipe their tears! These treasures are gon'na be hot off the press in a matter of a few days, and Jan's accepting pre-orders which will be shipped as fast as you send 'em in. 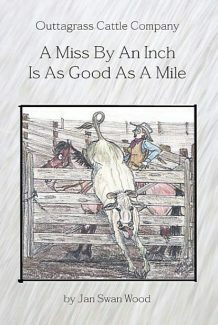 In a world wracked with inflation this amazing cowgirl has held the price to the same reasonable $15 she charged two years ago for the first book! South Dakota residents do haf'ta fork over an additional 60 cents per copy for the Governor, and shipping is $2.50 each. You get a bargain with those multiple orders, though – she'll have two copies in your mailbox for $3.50, an' for three or more copies you pay a mere $5.00! Jan's Dakota cowgirl background inspires her true-to-life, so-real-it-hurts kind of humor. A mother load of hilarious cartoon ideas have exploded in her head while enduring decades of grass roots ranch labor across the northern plains and prairies as well as in the desert Southwest, experiencing the many rural variations of Murphy's Law. You'll recognize yourself, your spouse, an' many of your neighbors on these pages; an' it's certain well-worn copies of A MISS BY AN INCH IS AS GOOD AS A MILE will grace coffee shops, kitchen tables and ranch bookshelves for years to come. Typically frugal, Jan once again didn't order nearly enough copies to meet the stampede of Christmas shoppers that'll flood her mailbox, so you'd better lay this paper down and send your order IMMEDIATELY, or it could be too late!! Get your name on the list by dialing (605) 456-2559; via email at teakwoodike@yahoo.com; or on snail mail at 13340 Hope Road, Newell, SD 57760. That'll ensure a Merry Christmas for you an' yours! !